If you spent a lot of pocket money on videogame magazines back in the ‘90s, then the story of how Mean Machines magazine was divided to become Mean Machines Sega and Nintendo Magazine System should be familiar. It’s not quite so common knowledge however that Impact’s Sega Force Magazine also eventually split into two different magazines – Sega Mega Force and Sega Master Force. It was a brave thing to do seeing that the Master System was massively outsold by the NES and as such never had the same level of support. A scant handful of European publishers and Sega themselves kept the system afloat for most of its nine year lifespan, but even then Sega would only release a big new game on it once every three or four months. 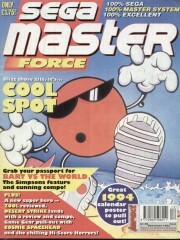 With the magazine making a debut in August 1993, the Master System was hardly a spring chicken at the time either. It’s not hard to imagine that those who did own at Master System at the time already had their hopes set on “upgrading” to a Mega Drive in the not too distant future. 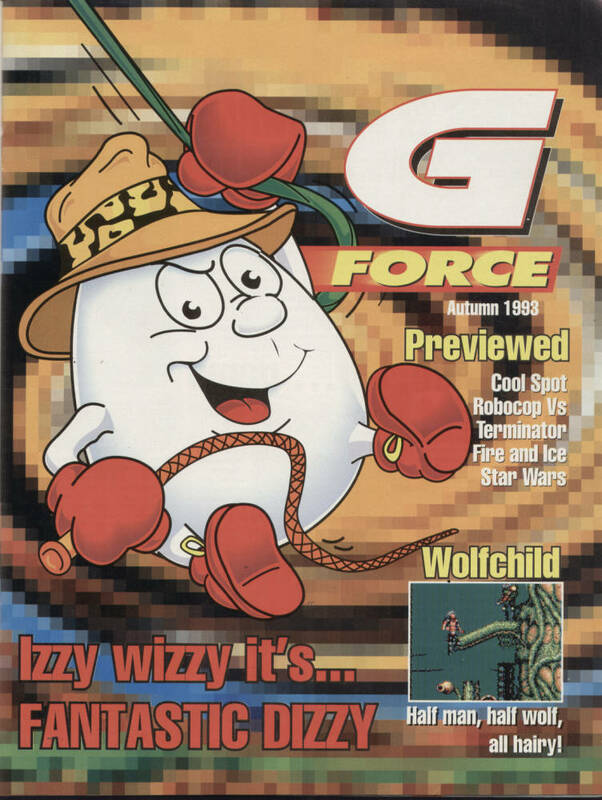 Nestled inside the £1.50 magazine – which rose in price to £1.75 as soon as issue 4 – was a pull out section dedicated to the Game Gear, entitled G Force. This is the closest the battery-guzzling handheld ever got to having it’s own dedicated magazine. In theory it was a nice idea to give the Game Gear its own section, but in reality the writers just ended up having to preview and review games near identical to their Master System counterparts either in the same issue or an issue later. A few games were released on Game Gear first, such as Fantastic Dizzy, but it was a rare occurrence. The old saying “you get what you pay for” very much rang true with Sega Master Force. The quality of writing was no better or worse than other magazines of the era, but each issue only had 60-odd pages. News led the way in a ‘stop press!’ section, followed by previews and reviews. The last half of the mag then featured guides, letters, classified ads and a letters section presented by fictional character Gutter Snipe. We assume this was meant to be their version of Mega Machine’s Mean Yob. We don’t ever seem to recall Yob using the phrase “Oh my good golliwog!” though. Reviews were light on text, featuring large screenshots and decorated with artwork that sometimes took up quarter of a page. Each writer gave their own opinion, with some curiously contrasting results – one reviewer thought Batman Returns was terrible while another thought that it was pretty good. Graphics, sound, playability and lastability were each given a score out of 100 for every review. Incidentally, Batman Returns ended up getting 54% even though it was described as being “below average”. 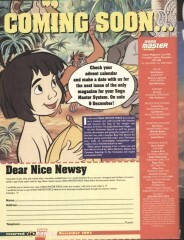 Sega Master Force only ran for six issues and must have been culled on a whim, as issue six had a ‘coming soon’ page promising a look at The Jungle Book and Jurassic Park. Usually during our magazine look back features we delve into the contents of a single issue, but seeing as only six issues exist we’re going to take a look at each. 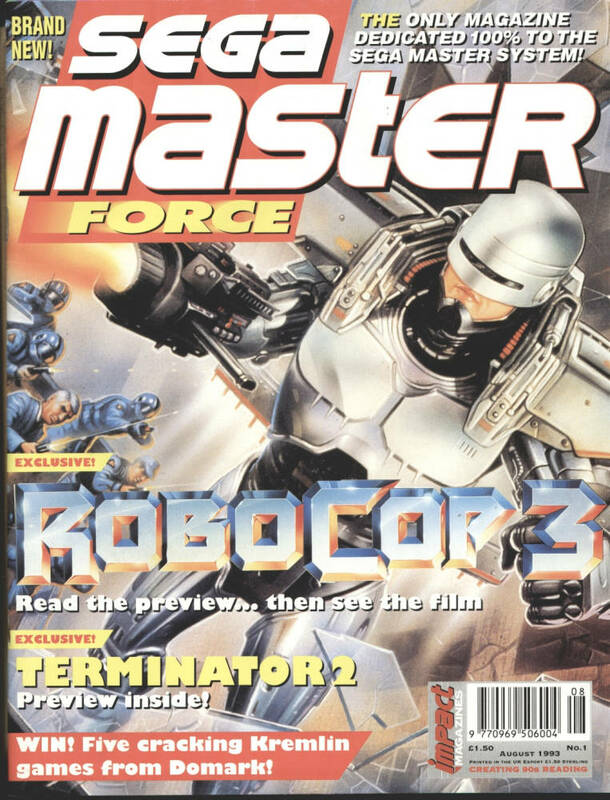 Sega Master Force launched with a Robocop 3 preview as a cover feature. Hardly a glowing start, considering both the film and game were on the smelly side. The cover was at least eye-catching. 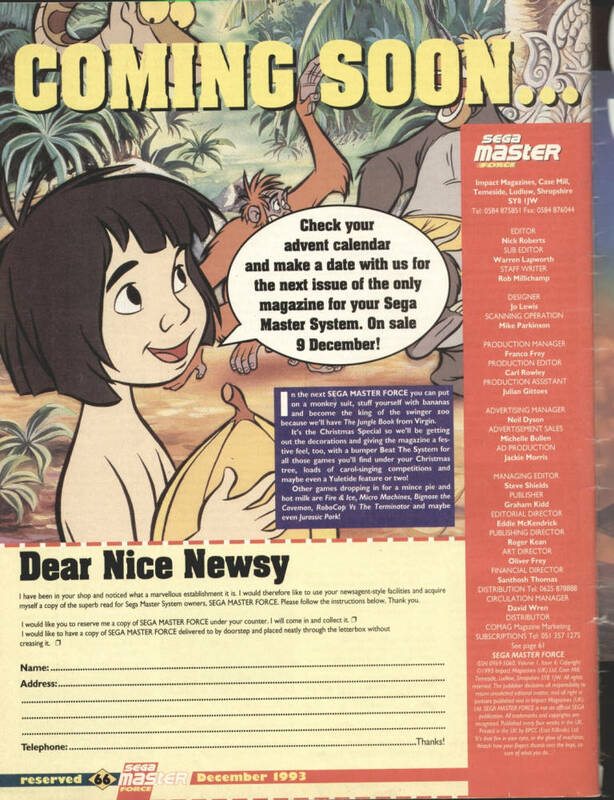 The news section instantly proved that the writers weren’t biased in the slightest – the upcoming Phillip’s CDi, rather oddly, had a half page dedicated to it. 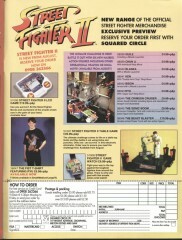 There was also a look at some Street Fighter II merchandise and some Marvel trading cards. Must have been a slow news month. Amusingly, the writers had a harsh dig at the newly released Sonic the Comic, calling it “juvenile” and describing the art as “banal”. “Why does Doctor Robotnik keep making stupid egg jokes?” they mused. There was a quick look behind the scenes at Domark games, where they got to chat to the developers of Desert Strike. This was followed then by previews of Robocop 3 and Terminator 2. Little did the writers know at the time that the two would soon be coming head-to-head on Master System in Robocop Versus The Terminator. Batman Returns, Andre Agassi Tennis and Crash Dummies got the review treatment on Master System while WWF, Mickey Mouse: Land of Illusion and Home Alone were reviewed on Game Gear. They also reviewed Double Dragon Xtra on Game Gear. Where they got that name from we aren’t sure – the only Double Dragon game to be released on the Game Gear was subtitled The Revenge of Billy Lee. The legendary Oliver Frey was responsible for issue two’s artwork – a rather menacing image of Mortal Komat’s Goro. 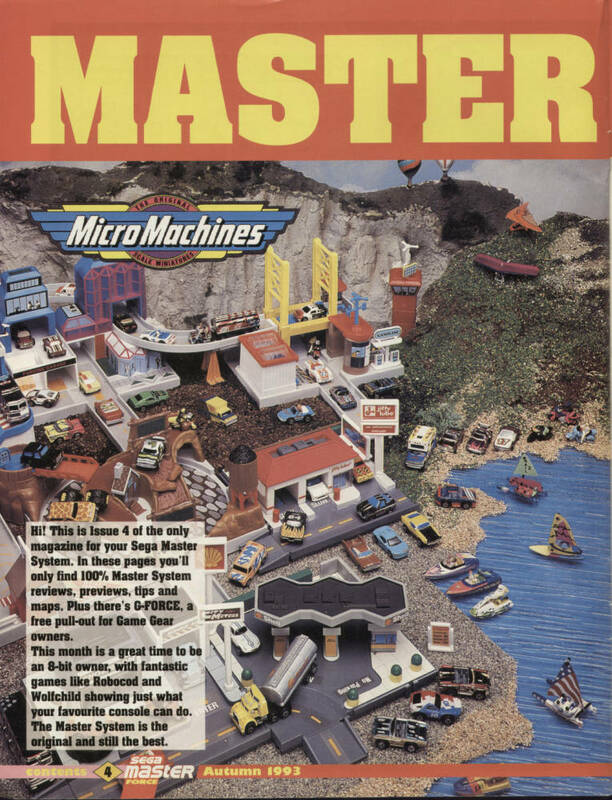 The news section was thankfully much more relevant this month, announcing Dizzy, Micro Machines, Cool Spot, The Addams Family and more. They did though also slip in the announcement of a new Aliens comic book series. There was a four-page preview of Mortal Kombat, two pages of which focused on biographies of the six playable characters rather than going into the game itself in great detail. The Flash, California Games 2, GP Rider, World Tournament Golf and GP Rider had critical eyes cast over them. California Games 2 got a right old mauling, resulting in a 32% review score. With only four events on offer, it’s not much of a surprise. G-Force introduced us to Sonic Chaos – where they jumped the gun and reported it to be a Game Gear exclusive – and Ren and Stimpy: Quest for the Shaven Yak, which was indeed exclusive to the handheld. The last part of the mag featured the usual assortment of slightly dull monthly features. This advert for Street Fighter II action figures and LCD games did catch our eye though – note the ‘beast blaster’ vehicle. That certainly took a liberty with the license. Chuck Rock 2 led the way for this issue, receiving a rather brief two page preview. Domark’s Star Wars on the other hand got a four-page preview. We assume the fact that Star Wars was a belated conversion of the NES version prevented it from getting the cover. The news section confirmed Road Rash, Cool Spot, Road Runner, Streets of Rage 2 and Astérix 2. They were adamant that it was actually called Astérix 2 but that wasn’t the case – it was eventually released as Astérix and the Secret Mission. 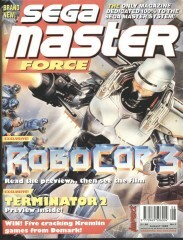 There were just three reviews this month – Mortal Kombat, Power Strike II and Robocop 3. That last one ended up getting 55%, despite being issue one’s cover game. Fair play. Just one Game Gear game was reviewed in G-Force – puzzler Junction, which they failed to point was a US-only release. A Mortal Kombat guide took up most of the rest of the magazine. The next issue was promised to be “a cracker”. Let’s see, shall we? There was slight change of plan for issue four, it would seem. The price had increased by 25p, but there was a free Mortal Kombat badge given away in a presumed attempt to soften that blow. There had been a general spruce up inside too, giving the magazine a more professional look. Also note that this issue was titled the ‘Autumn issue’. Odd. The news section this month made us smile – it included a piece on Thora Hird “of Sunday evening TV” playing Virtua Racing in Hamleys. What was she doing there? Taking some young choir boys on a trip around the famous toy store, of course. 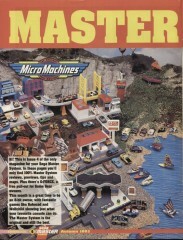 We also love the use of Micro Machines toys for the opening editorial. 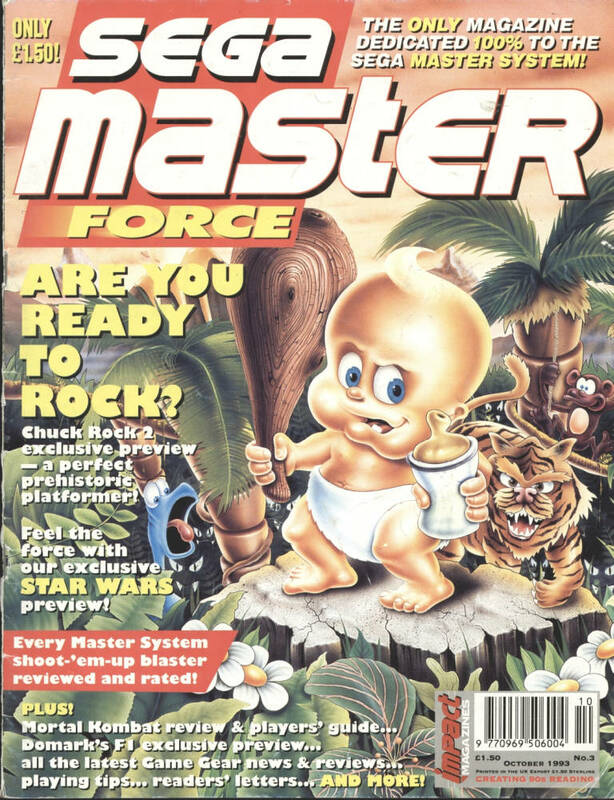 James Pond II, Chuck Rock 2, F1 and Wolfchild on Master System were reviewed this month. 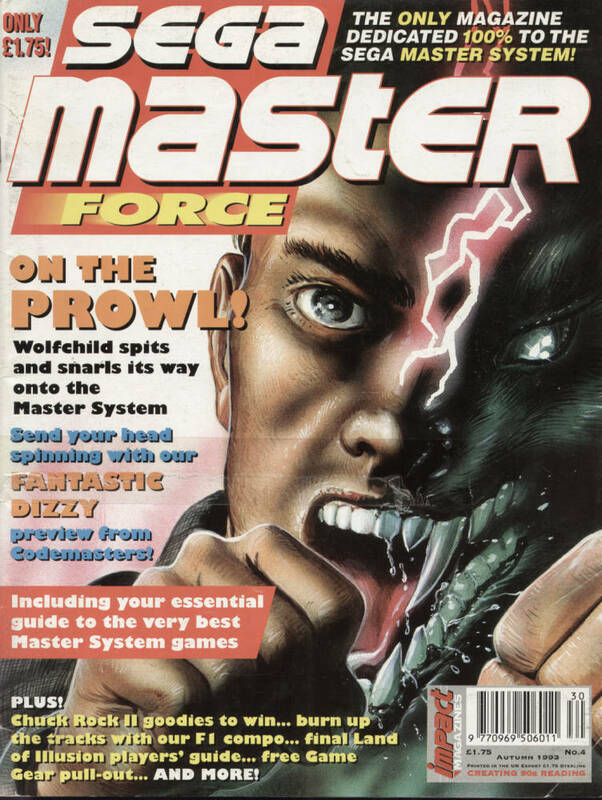 Oddly, it was Wolfchild that made the front cover. We would have wagered that James Pond would have been a better choice given the demographic at the time. 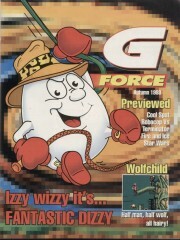 Fantastic Dizzy was G-Force’s headline review, a month ahead of the Master System version. Strider II was reviewed as well. “A big improvement over the original,” they said. Really? We remember it being downright terrible. We wouldn’t be surprised if this issue was the best selling, due to showing off Sonic Chaos in all its majesty. The news section announced The Last Action Hero, Hook and Macro’s Magic Football. Not one of these ended up being released on Master System. Hook was finished, but canned. The other two only made it out on Game Gear and Mega Drive. Also in the news was a look at the oft-forgotten trackball Sonic arcade game. “The stunning three-dimensional graphics are equal to those in the excellent Virtua Racing.” Obviously the word ‘isometric’ didn’t exist back in 1993. Even though Christmas 1993 was fast approaching, just three Master System games were reviewed. Ultimate Soccer snagged 90% while Fantastic Dizzy and PGA Tour Golf are awarded 87% and 79% respectively. G-Force meanwhile saw the Game Gear play catch up, with reviews of James Pond II and Chuck Rock II. The last half of the mag included guides of Prince of Persia and Star Wars. Issue six promised to look at three new Simpsons games – Bart vs the World, Bartman meets Radioactive Man and Itchy & Scratchy. Only one of these ended up being released on Master System – the mediocre Bart vs the World. And here’s the final issue. After mentioning Cool Spot in the news section for months, it was finally reviewed. Desert Strike, Cosmic Spacehead, Bart vs The World, Zool and Terminator 2: Judgment Day joined the circular red spot in the review section. That’s not a bad line-up to bow out on. News was slim on the ground – some new Sonic the Hedgehog stationary even got a quarter of a page mention. For a third time running The Addams Family was confirmed to be heading to Master System, and while the release list they printed was a lengthy one, most of the games on it either end up being released on Game Gear in the US only or canned altogether. That’s not to say that support dried up entirely after the magazine’s demise. Sega continued to drip-feed new releases for another couple of years, including conversions of Ecco the Dolphin, Sonic Spinball and Dr. Robotnik’s Mean Bean Machine. The Smurfs Travel the World was the final Master System release, arriving as late as 1995. That’s the same year the Sega Saturn arrived. Amazing, really. 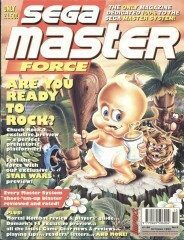 Sega Master Force should remind us how strong the videogame magazine market used to be. Sega’s 8-bit formats were never particularly well supported, yet somebody somewhere believed they could turn a profit by releasing a magazine dedicated to them. Master System and Game Gear owners were often seen in the letters pages of Sega Force asking for more coverage of their beloved systems. 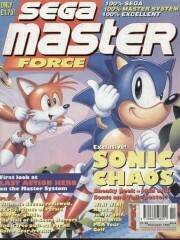 Even though Sega Force Master only lasted six issues, they finally got their wish. All scans supplied by the almighty SMS Power. ‘It was a brave thing to do seeing that the Master System was massively outsold by the NES’, in the US maybe. The Master System was VERY successful in Europe. It did very well in Europe, but it was still outsold. Wikipedia claims 8m NES were sold in Europe and 6m Master Systems. Perhaps not “massively outsold” but outsold all the same. Hi Matt, there was a 7th issue of Sega Master Force given away with Sega Force Mega #7. It was promoted as a ‘best of’ issue containing reprints of previous reviews. The only new that I recall was that Sonic Chaos was given a score (though most of the text matched the preview). The next month page made it clear that Sega Force Mega would be back to normal in the next issue, but there was no mention of SMF being continued. 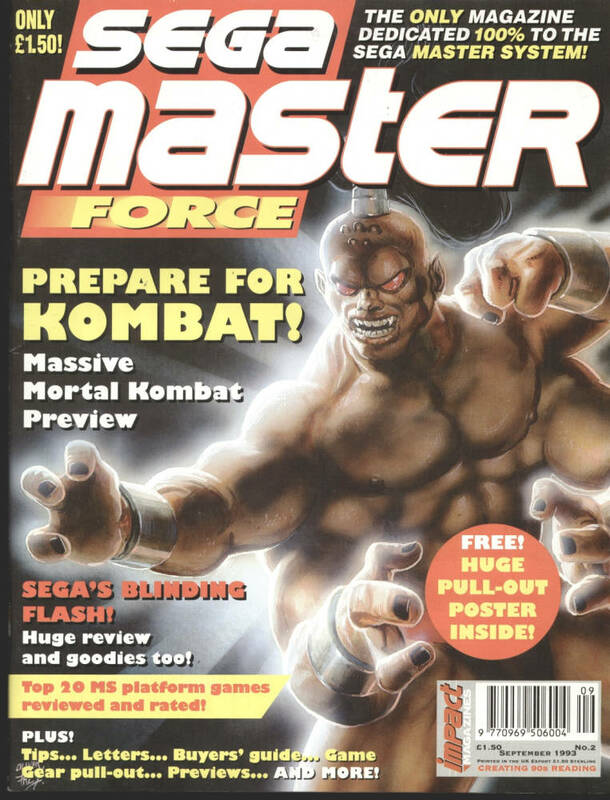 In the end, this was the final issue of Sega Force Mega as well, as the publisher went bust soonafter.